Talk about truth in advertising. 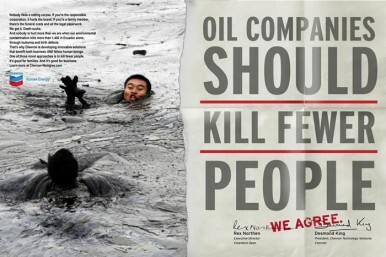 A day-long comedy of errors, and Chevron's waking nightmare, began when Rainforest Action Network and Amazon Watch, together with the Yes Lab, pre-empted Chevron's multi-million dollar “We Agree” ad campaign with a satirical version of their own. 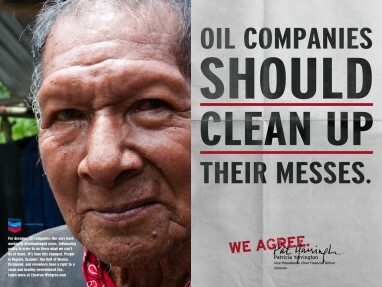 The activists' version highlights Chevron's environmental and social abuses—especially the toxic mess the oil giant has left in Ecuador, which Chevron has been attempting to “greenwash” for years. 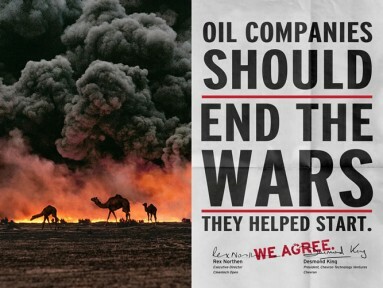 Nine hours later, after issuing its own “We Agree” press release, the real Chevron decried the hoax in a predictably curt and humorless manner. Shortly thereafter the counter-campaign issued a much better denial on Chevron's behalf, laying out Chevron's principal arguments in its Ecuador case. Throughout the course of the day a slow vaudeville unfolded on the web, as a number of press outlets, from industry mouthpieces to the AFP and even a watchdog group, produced accidental mash-ups of “real” and fake information. The activists' continuing efforts ensured that Chevron's PR strategy backfired severely, as media about the action highlighted Chevron's embarrasing and atrocious environmental and human rights record. That was exactly the point, said the activists: to raise public awareness around Chevron's abuses in Ecuador and elsewhere, and ultimately force Chevron to do something about them. See ChevronThinksWereStupid.org for an archive of amazing posters submitted by users in response to our contest call. Below are three of the original ones.